Polar Caves Park is a family-owned and operated attraction situated in the White Mountains of New Hampshire. The nature park has provided visitors with a chance to explore past the boundary of time since 1922, to explore caves that formed millennia ago during the time when the last Ice Age crossed the land. Polar Caves includes nine granite caves through which guests can shimmy, squeeze, and duck. The Polar Pinch Cave is a bit of a pinch to move through, as well as is Fat Man's Misery where visitors will need to shimmy their way through the tight spot. Visitors should be wary not to look down when walking the narrow path of the Devil's Turnpike, while some may find it a squeeze to get through the narrow crevasse of The Lemon Squeeze. If guests get tired during their visit, King Tut's Cave is perfect for a short rest on a bench fit for even a pharaoh. The last of winter's ice can be touched even during the summer in the Ice Cave, while the crush of rocks from millennia ago can be felt in the Orange Crush. The Indian Council Chamber will make visitors wonder whether they should turn back or venture onward. The Glacial Wall at Polar Caves is the perfect first experience for anyone wanting to rock climb but doesn't know where to start. Instructors help climbers reach the top of the wall and return safely to the ground. The vertical climbing wall offers a series of five different climbing routes of various difficulties that feature both man-made and natural hand and foot holds. The Ascent, or "Via Ferrata" which means "Iron Way," is a climbing option for braver visitors to the Polar Caves. The guided rock climbing experience challenges guests to navigate an iron way measuring 172 feet in length, and afterwards rappel back down. The Ascent is one of only a few local iron ways, and is the only one with guided instruction. The thrilling adventure is ideal for those looking for a challenge and spectacular views. 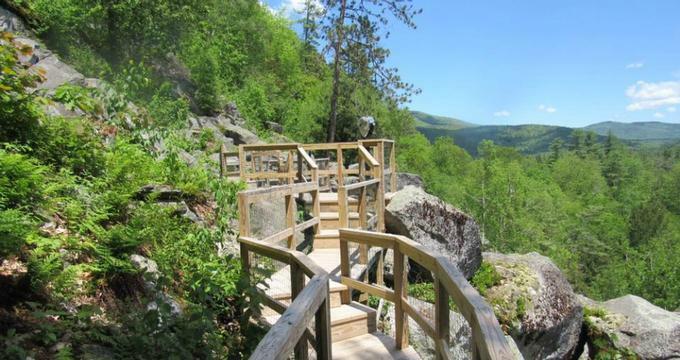 Visitors can explore the stunning scenery of the Polar Caves park while walking along the Rocky Ridge Way, a trail network winding around the park. With its position along the White Mountain National Forest's southeast border, Polar Caves offers amazing views of the surrounding wooded areas and mountains. The wooden walkways provide guests with a chance to explore the cliff sides and landscape of the grounds, offering views of the horizon, park features, and caves not found anywhere else. Rocky Ridge Way provides access to the climbing experience of The Glacial Wall. While strolling along the Rocky Ridge Way, visitors can take a break at one of the park's benches, gazebos, or picnic area and enjoy a snack, or wander into the Maple Lodge and its Sugaring Exhibit. The exhibit in the lodge demonstrates how maple candy is made. Guests to Polar Caves can find unique souvenirs in the gift shops located in the Maple Lodge and Main Lodge, including homemade fudge and roasted Bavarian nuts.